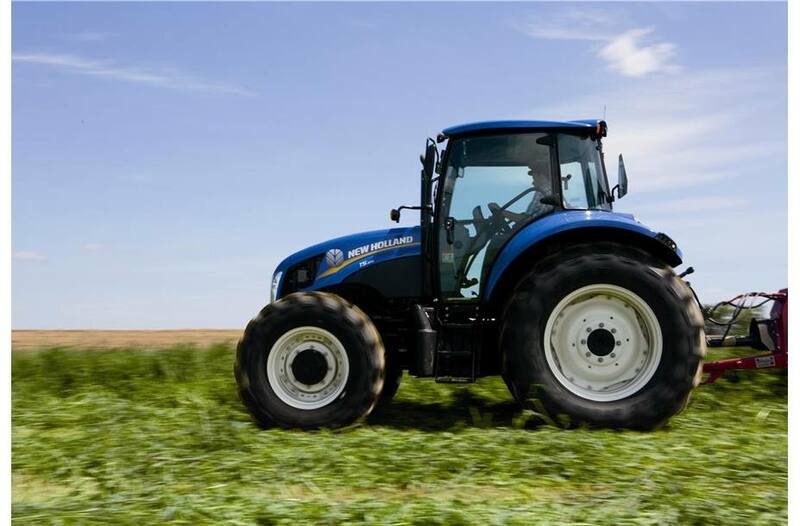 Welcome To The New Business Class of Farming: T5 Series tractors are redefining business class farming. 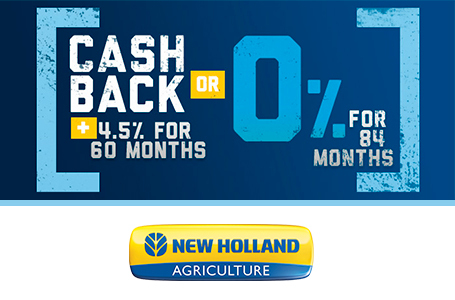 At New Holland, we know the jobs you face as a mixed farmer demand the utmost from your utility tractor. While it's large enough to perform fieldwork from early spring to late fall, its agility and frame size allow you to easily navigate through your barnyard. We understand your desire for superior comfort, visibility, and smooth-shifting transmissions. Fortunately for you, T5 and T5 Electro Command™ tractors are here. Take a close look. After all, you deserve a promotion. Welcome to the corner office! Common Rail Is Common Sense: A utility tractor needs to have power, and a new T5 will certainly give you that. This 3.4L (207 cubic-inch) turbocharged F5D engine provides you with responsive power. This engine utilizes a high pressure common rail fuel injection system to enhance combustion, which is crucial for lowering emissions for Tier 4A compliance. 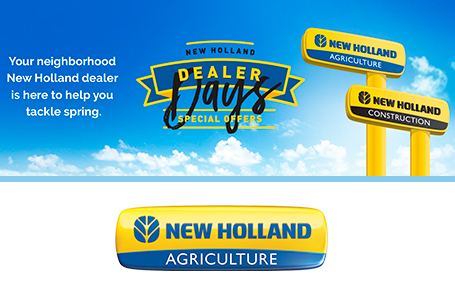 New Holland introduced common rail to the agriculture industry in 2003. Today, these enhanced engines are the latest generation to reap the rewards of this technology, optimizing performance and quietness significantly in comparison to the previous Tier 3 NEF engines. Keep Going In Difficult Conditions: When you ask for more power, your F5D engine will give it to you with an enormous torque backup of 35%. 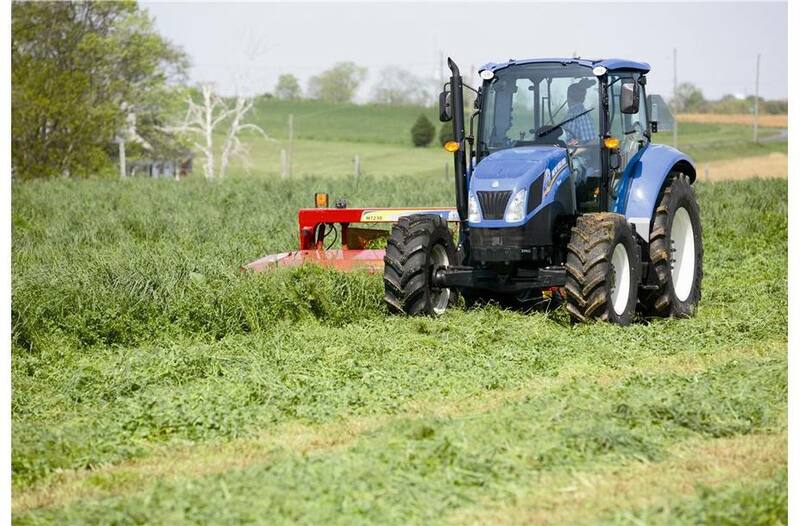 So, when you’re working in demanding conditions, like round baling high-moisture hay in uneven swaths, you’ll maintain both your forward speed and PTO speed while these large portions are fed into your baler. Clean Energy Leader: In order to fulfill Tier 4A emissions standards, F5D engines are equipped with a Cooled Exhaust Gas Recirculation (CEGR) system and a Diesel Particulate Filter (DPF). Rest assured, Fiat Power Train (FPT) has ample experience with CEGR and DPF on passenger cars and commercial light-duty trucks. CEGR is the wise choice for the T5 tractors because it keeps their physical dimensions small, which is what you expect from a utility tractor. CEGR also enhances engine density up to 36 HP per liter of displacement because fuel injection and CEGR are electronically monitored. Finally, the cooling requirements and costs associated with installing a CEGR system on a smaller engine are inherently lower, making this system a smart choice. 12x12 Power Shuttle: The entry-level 12X12 power shuttle transmission is the perfect choice for your general applications. This transmission has the ideal mix of speeds, making it perfect for matching the needs of your implements. Traditional, robust operation makes this transmission great for operators in search of simplicity. 20x20 Power Shuttle with Creeper: The 20X20 power shuttle transmission is ideal for special applications, like vegetable farms. 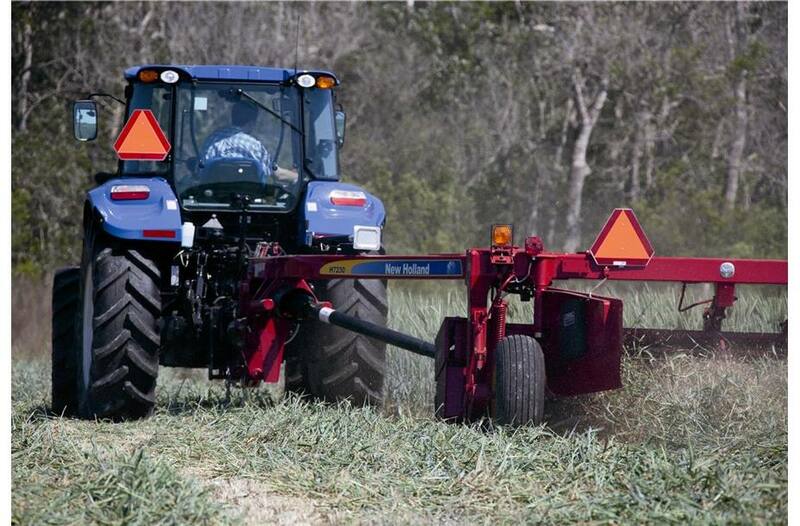 Tackle planting and harvesting with creep speeds as low as .12mph (.2kph) and then cruise back to your farm at a top transport speed of 25mph (40kph). When combined with the premium features and comfort of a T5, you certainly won’t mind spending time going slow out in the fields. 24x24 Dual Command™ with Power Shuttle: The 24X24 Dual Command™ transmission features a Hi-Lo Splitter full load powershift. Activated on the go, this transmission increases the amount of torque at the wheels in transport situations to prevent slow down on hills. This is ideal for demanding field conditions, offering a 15% reduction in forward speed to increase available torque by up to 18%. The exclusive PowerClutch button, which is conveniently located on the back of the gear lever, shifts between eight speeds in the three main ranges without the need to depress the clutch pedal. This feature will certainly help reduce your fatigue on those long working days. Ergonomic Powershuttle: The column-mounted electrohydraulic Powershuttle can be conveniently operated without taking your hand off the steering wheel, helping to enhance your safety during loader work. You can conveniently regulate the aggressiveness setting, even while moving, with an the ergonomically positioned switch on the B pillar. A softer setting is perfect for general field work, while a more aggressive setting is great for near instantaneous direction changes during loader work. 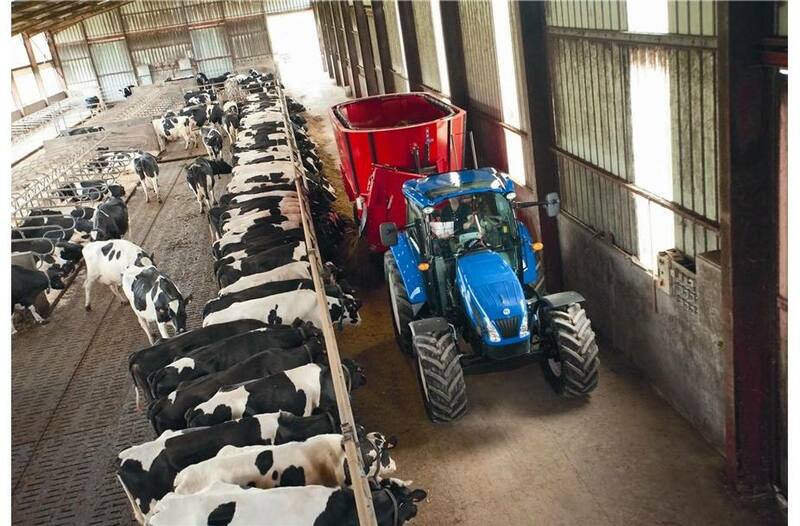 Powerful and Precise High-Capacity Hydraulics: It’s important to have a tractor with powerful and precise hydraulics to ensure that you do a quality job. 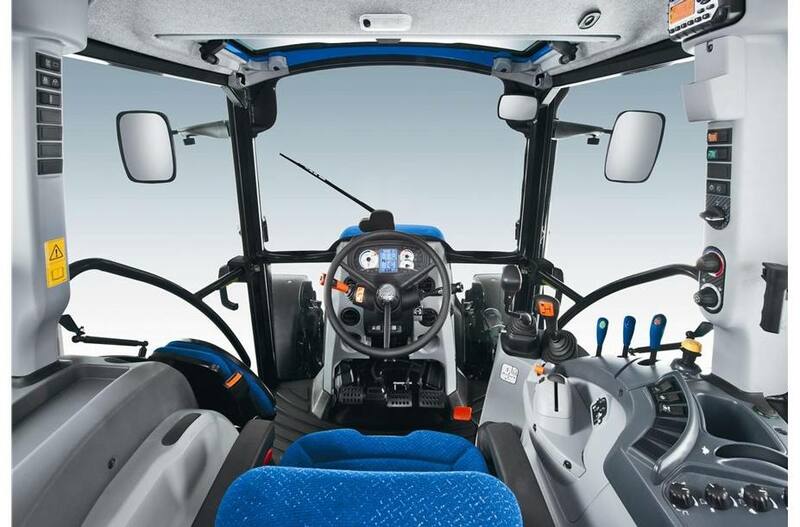 An open center system with tandem gear pumps is featured on all T5 series tractors. These two pumps work independently, one powering the high pressure circuit (implement pump) and the other powering the low pressure circuit (steering). The implement pump on T5 tractors has a flow of 17.2 gallons per minute (gpm) 65.1 liters per minute (l/min) and the steering pump has a flow of 10 gpm (38 l/min). Together these two provide 27.2 gpm (103.1 l/min) of flow. A larger implement pump can be installed, boosting flow to 22.2 gpm (84 l/min). Additionally, a larger steering and services pump with 11.4 gpm (43 l/min) can be installed as well, combining total flow with the optional larger pump to an impressive total of 33.6 gpm (127.1 l/min). 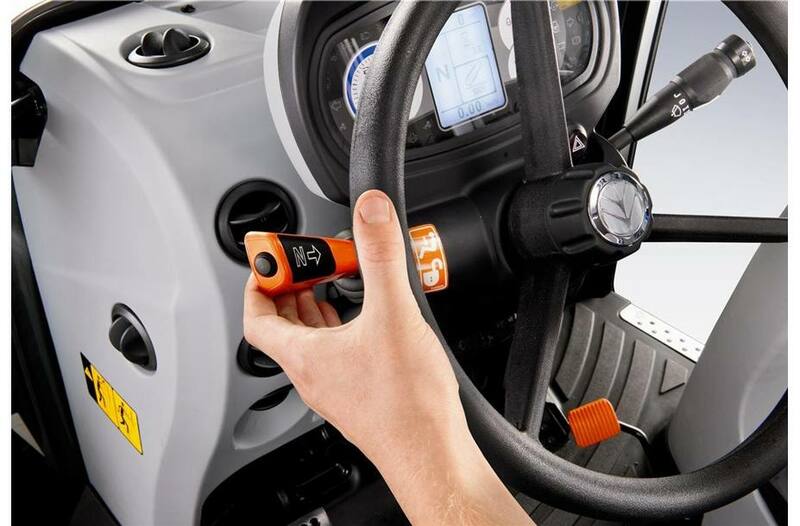 Two closed center rear remotes with quick release couplers are standard, but all T5 tractors can be equipped with three remotes as an option. Two mid-mount valves are also optional for you to choose from. The first option is a two-function mid-mount valve and joystick with one switch. The other option is an electrohydraulic, load-sensing, mid-mount valve that is controlled by the unique armrest-mounted electronic joystick. Hefty Three-Point Hitch: Measured at the ball ends, the rear linkage on a T5 tractor is capable of lifting 6,393 lbs. (2,900 kg.). For those who demand more lift capacity, two additional 50mm auxiliary lift rams can provide an outstanding 10,452 (4741) of lift. To control the three-point hitch, an ergonomic mouse is located within easy reach of the operator’s right hand. This mouse is an acclaimed New Holland design for one-handed operation. For instance, a convenient fast link lower button makes returning an implement back to work even easier, helping to speed up your productivity. 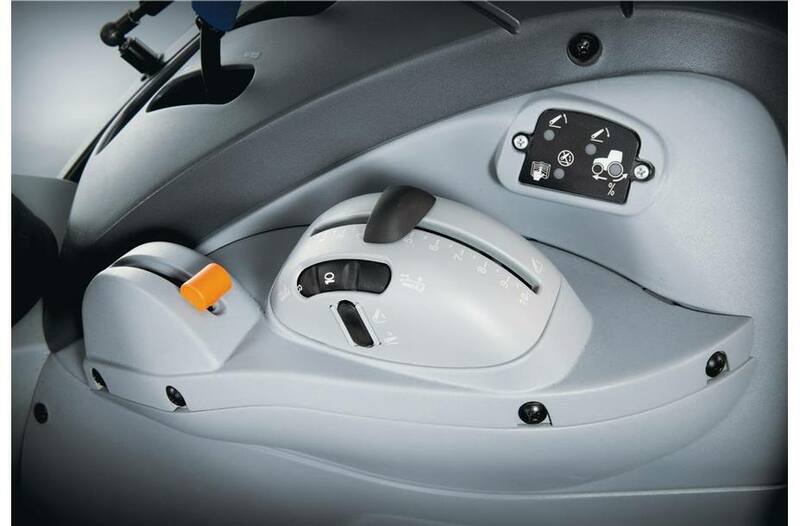 Rear fender controls are also standard on all T5 tractors, saving you the hassle of having to climbing on and off the tractor when hooking up implements. 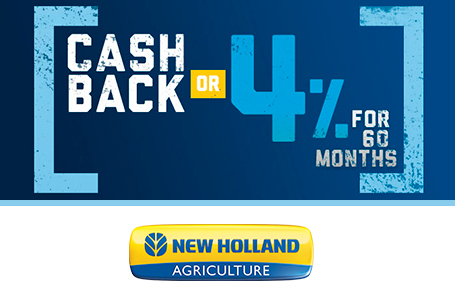 A front three-point hitch with and without PTO is also available to increase your tractor’s versatility even more. TerraLock™ Automatic Traction Management (T5 Electro Command™ Models): New Holland’s renowned Terralock™ solution is simple to set-up and operate. Once engaged, the system automatically controls four-wheel drive and differential lock engagement through continuous dialogue between speed sensors, the brake pedal, and rear linkage. When making tight turns, like on headlands, the system will automatically disengage. With the wheels free to turn and not locked together, the “scrubbing” effect on tires is eliminated. Auto PTO On The Go (T5 Electro Command™ Models): You’ll never think about engaging PTO implements the same way after equipping your T5 Electro Command™ model with the optional Auto PTO feature. 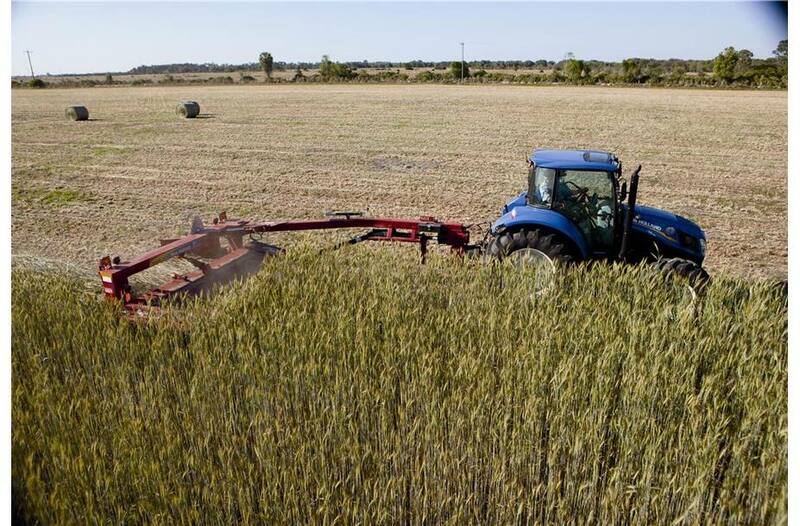 After engaging the feature, the system automatically disengages the PTO on your 3-point-mounted implement when it reaches a predefined distance from the ground. When your implement returns to the pre-set threshold, it automatically reengages. A New Vision of Cab Comfort: The VisionView™ Cab High In The Sky: You’ll be impressed when you look up and have a perfect view of your loader thanks to the optional high visibility panel. Open the panel up when you want fresh air or close it and pull the integrated sunshade across when the sun gets too hot. Perfectly Placed Controls: The most frequently used controls are all conveniently located on the CommandArc™ console to your right. This ergonomic cluster puts your PTO, hydraulic levers, throttle, three-point hitch controls, and even your loader joystick all in one convenient location. Cool Technology: The new high-performance air conditioning system features dual zone technology to guarantee high performance during the hottest summers and the coldest winters. 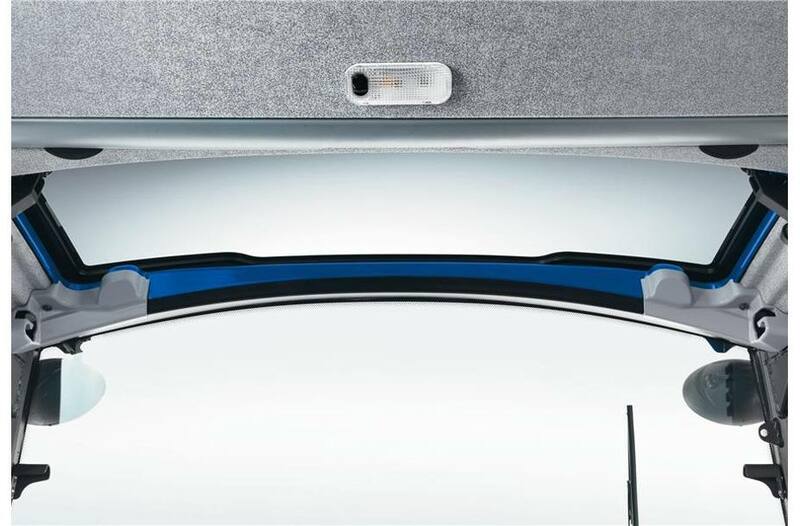 Control your air flow coming out of the ten repositionable vents with the B-pillar mounted controls. 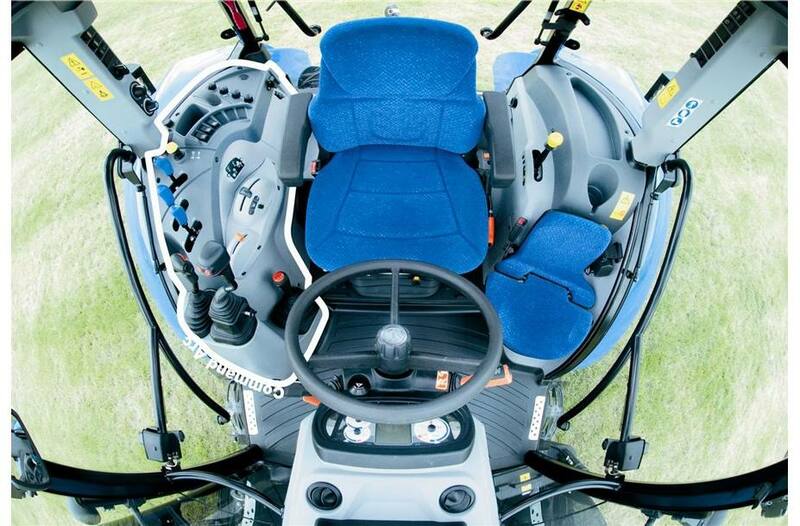 These vents provide air flow to both the upper and lower portion of the cab while also warming and cooling your feet. Sit Back and Relax: Tailor your comfort with an optional premium, air suspension seat. You can also teach someone else how you do things thanks to a full-size instructor seat. Performance At A Glance: The clear and visible instrument cluster moves in conjunction with the tilt steering column for an unobstructed view of key operating information. Consult the easy to read performance monitor for information on your acres worked, direction, and service information in the convenient three-section display. Don't Brace Yourself. Suspend Yourself: For the ultimate counter move for harsh bumps in fields, consider the Comfort Ride™ cab suspension option available on T5 Electro Command™ models. Similar to the system found on T6, T7, and T8 tractors, your T5's Comfort Ride option features two isolation donuts at the front corners and two shock absorbers with a sway bar at the rear of the cab. These work in harmony to isolate you from up and down motions and side-to-side swaying. 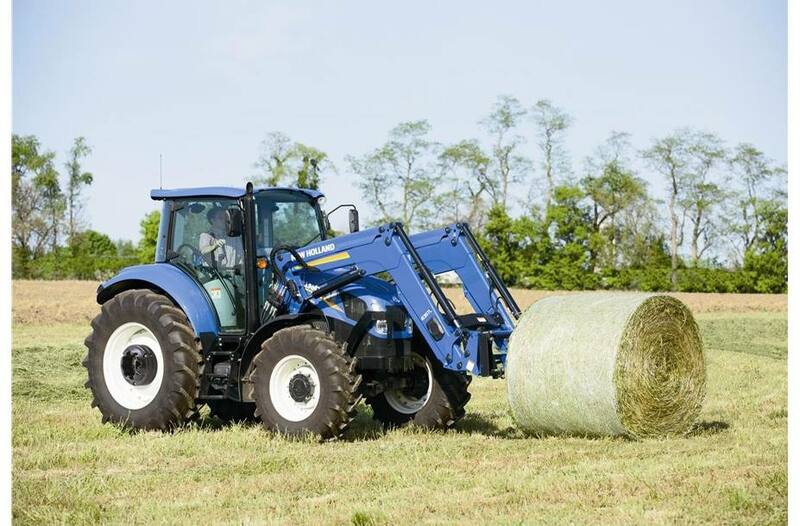 New Blue Designed To Help You: As a farmer, you want to spend more time working and less time maintaining your tractor, so T5 series tractors have been designed to be ready whenever you are. 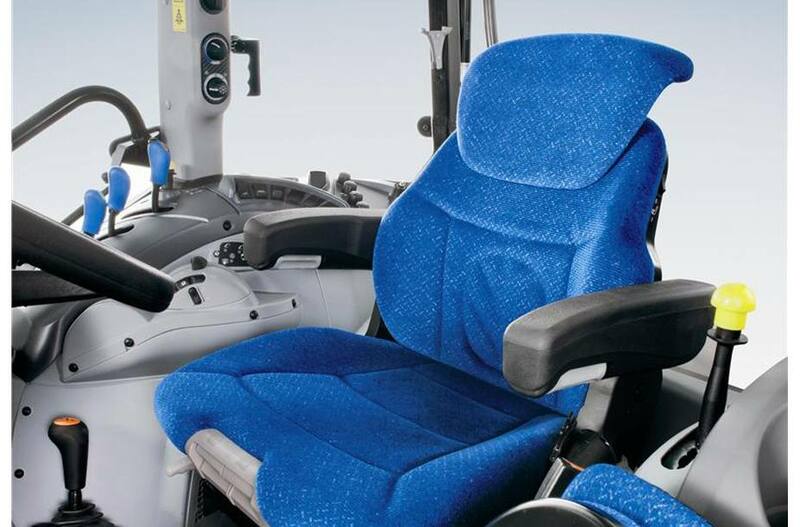 The long, 500-hour service intervals, impressive fuel economy, and simple daily checks thanks to the one-piece flip-up hood make maintaining your T5 simple. Smart Service Points: Your engine oil and fill points are conveniently located with no need to lift the hood, which makes routine checks faster and servicing simpler.